Today, I was pleasantly surprised to see that Houston finally got COOLER! Normally it is around 90 degrees outside but today’s High is only 73. Outside is slightly chilly and breezy. “It’s beginning to look a lot like” … Autumn! So I pulled out a sweater I bought during my August trip to “No SALES TAX Under $100” New Jersey. It is from Armani Exchange. I love the detail of it. It is gray cotton with a black mesh that’s striped and dashed pattern. 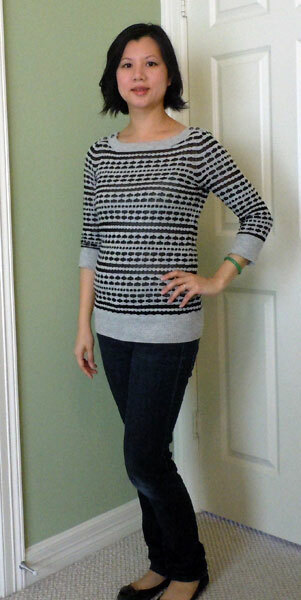 The broken up pattern contours to my waist and it’s a light sweater perfect for this season. I love to just throw on a good top with a standard basic bottom. A good sweater makes the outfit. Do you think I can wear this outfit on a Date Night (just add jewelry), to work (add heels), and to a PTO Meeting?